“All the Money in the World” is the true story of the kidnapping of J. Paul Getty’s Grandson, John Paul Getty III. The story depicts the desperate pleas from John Paul Getty III’s Mother, Gail (Michelle Williams) as she begs the billionaire J. Paul Getty (Christopher Plummer) to pay the ransom. “All the Money in the World” is a thought provoking mystery with a philosophical punch that shows no mercy. There is plenty of Mystery, Suspense and Intrigue to keep you entertained. Christopher Plummer is brilliant as J Paul Getty. Michelle Williams and Mark Wahlberg bring a fresh perspective to the story. 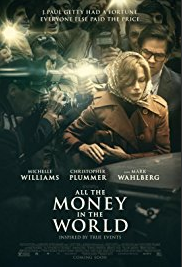 “All the Money in the World” was not on my original “Watch List”, but the movie is definitely worth a look. This is a 3 ½ Star Movie!